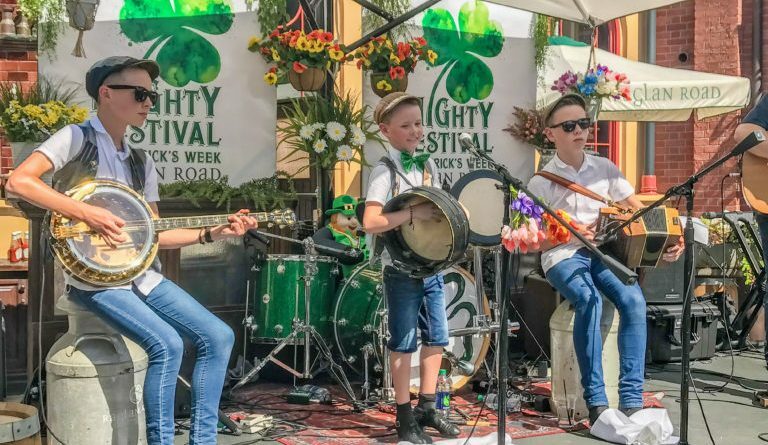 St. Patrick’s Day is coming up in just a few short days and if you’ll be at Walt Disney World, one of the best ways to celebrate and get your Irish on is by visiting Disney Springs for the Raglan Road Mighty St. Patrick’s Festival. The event, which lasts from March 15-17 will offer live Irish music, delicious food. dance lessons for kiddos, and more. The event will take place on March 15 from 3:00 p.m. through 1:30 a.m. and on March 16 and 17 from 11:00 a.m. until 1:30 a.m. Guests will be able to get complimentary face painting March 15 from 3:00 p.m. – 9:00 p.m. and March 16-17 from 10:00 a.m. – 8:00 p.m.
Young Dubliners – The Young Dubliners are known for their hearty rock and Irish-infused live performances. Ben Gunnery – Irish music superstar and multi-instrumentalist has been soloist for high-profile productions like Riverdance and films including “Lord of the Rings” and the Harry Potter movies. Briste — This inspiring all-female duo creates a fresh and exciting mix of country, folk and Irish traditional music. The Byrne Brothers — Their show combines exciting Irish tunes with modern dance beats. Reel Republic – Seriously talented musicians always pushing to make the next gig better than the last. Trad Gad – Three talented musicians will charm Raglan Road audiences with their vibrant performances. Maca – Three Irish sister-musician-songwriters dubbed “Ireland’s next big thing” are rocking Raglan Road Pub stages with their extraordinary talent. The Raglan Road Irish Dancers – The Raglan Road Irish Dancers perform throughout the Mighty Festival. You can even learn some traditional Irish dance steps – no experience necessary! Menu offerings will include the restaurant’s brunch, lunch, dinner and bar menus. In addition, throughout the event, the restaurant’s Cooke’s of Dublin counter-service eatery will offer Irish favorites, as well, including fish and chips, now available by mobile ordering. The entertainment schedule can be found at raglanroad.com.